I have been really excited to share this cd for review and giveaway with you all. 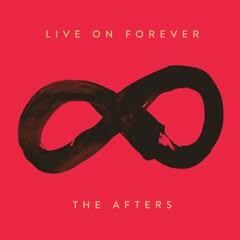 The Live On Forever has been a favorite of mine all summer. Now the song Battles is quickly rising to one of my favorites. The Afters have a unique and very modern sound that is fantastically different. When I tell people Christian music has come a long way - this is exactly the type of music I'm talking about. God-loving worship songs that are bridging the generations. I like Dust in the Wind by Kansas to help me through hard times.